Printed on 30 mil plastic credit card stock. This plastic card set is a must-have for anyone using GPS, map and compass. The set features 3 clear cards with 1:24,000, 1:25,000, 1:50,000, 1:100,000, and 1:250,000 map scales. 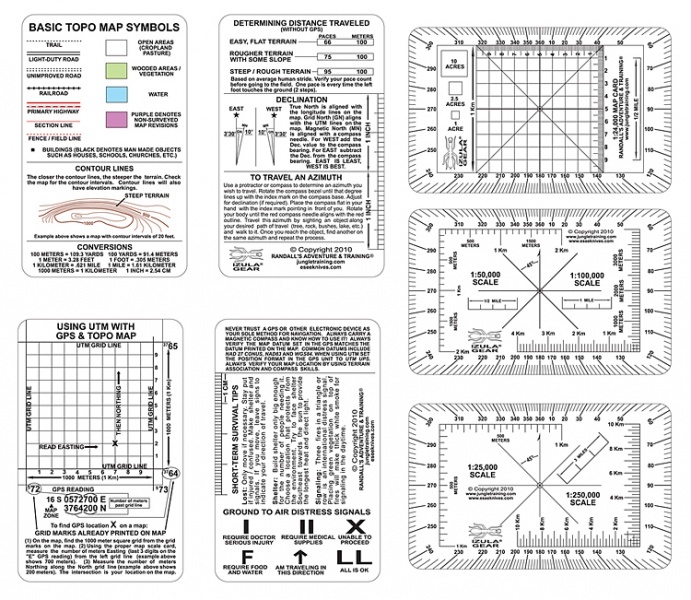 The set also includes two white cards with survival tips, signaling tips, instructions on how to read a topo map, how to adjust for declination, how to determine distance traveled, how to use UTM with your GPS and compass, and how to travel an azimuth. Printed on 30 Mil plastic credit card stock. Made in the USA. We laid our 1:24,000 map scale card out different from the standard 1:24,000 card. In other words, our 100 meter mark for Easting starts from the same zero point as the 100 meter mark for Northing. Other cards end their 1000 meter Easting mark at the point the 0 begins for the Northing. Simply put, our way of reading this is easier to teach to a newcomer and easier to apply to a map. All you have to do is take your plot coordinates from your GPS and put the Easting coordinates (from your GPS) on the proper grid line and then move until the Northing coordinates (from your GPS) are the correct meters away from the grid line and your point is exactly where the 0/0 mark is on your map card. You can also reverse plot the same way to enter a waypoint in your GPS. So, yes, we did our cards different but there is a reason behind it. Our method is much simpler to teach and learn and we have found it is also quicker to use, having used both methods to do navigation. 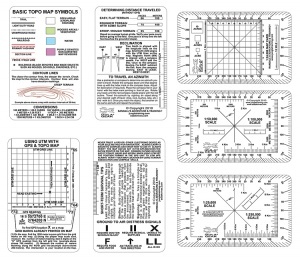 Purchase through PayPal by using the "Add To Cart" button above or use the form below to order the ESEE Nav Card set . Feel free to contact us if you have any questions about the ESEE Nav Card set .